Convenient swing down door for easy access to mittens, gloves, or scarves. Plans drawn FULL SIZE. Measures 10-1/4"H x 24-1/2"L x 4-1/2"D. Order Hardware parts package separately below. 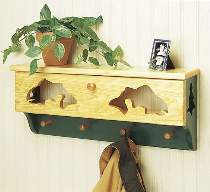 Catch-All Shelf Hardware Includes hinges, shaker pegs, magnetic catch and wood knob to make one catch-all shelf. Project plan, wood, and wood finish are not included.